This is not an evisceration. It's not a take-down. Like most people this year, I've had many thoughts about our presidential candidates. I've avoided making one-off posts and getting into political arguments on social media this year. Instead, I wanted to write a researched, considered argument for why I plan to vote the way I do. I think Donald Trump would be a potentially catastrophic president. I also think that Gary Johnson and Jill Stein are both unfit for the office. In the end, I'm planning to vote for Hillary Clinton, and I'm planning to be happy about it. First, let's discuss Donald Trump. I worry about his intolerance, I worry about his temperament, and I don't believe that he's the economic genius he purports to be. Trump has famously spoken out against Mexican and Muslim immigrants, and he seems to regard nonwhite Americans as lesser citizens. Time and again, dictators have used this "us versus them" mentality to gain power. In my mind, this is a huge red flag. Trump has bragged about how he would be militarily unpredictable, and he has become famous for his thin-skinned rants on Twitter. I believe this shows he has a temperament unbecoming of a candidate for president of the United States. Still, many people excuse all these flaws, saying that he has the financial know-how to be a great president. I disagree. Trump has spent much of his campaign calling NAFTA a disaster and lamenting America's loss of manufacturing jobs. But nonpartisan groups have called NAFTA's impact "relatively modest." Rather than trade agreements, technology has eliminated the need for some jobs while creating others. Finally, Trump hasn't even done exceptionally well with his own finances. An article in The Federalist argued that Paris Hilton is better at business than he is, and Fortune has pointed out that he be richer now if he'd invested his inheritance in index funds. Based on his intolerance and temperament, I don't think Trump would make a good president, and I don't think his limited financial success means that we should ignore his rough edges. Along with the two major-party candidates, I've also considered both third-party candidates. I don't fully buy the argument that a third-party vote is a throw-away vote. However, I'm not really impressed by either candidate. Johnson's politics are not really in line with mine, but even putting that aside, he's shown a surprising lack of awareness of the world, and even the US, bumbling questions about world leaders, Harriet Tubman, and domestic attacks. As for Jill Stein, she and I are more politically compatible, but I still think she'd be a terrible president. On multiple occasions, she has fanned the flames of conspiracy theories, such as the dangers of WiFi, and she also seems to lack a grip on reality. Both candidates seem like they really want to make a statement with their candidacies, but I'm not sure that either actually wants to be president. And that brings us to Hillary Clinton. I've mentioned that I support her, but I haven't talked about how I got to this place. In the primaries, Bernie seemed like an interesting choice. I really liked some of his ideas, like taking away power from big banks, and he seemed unscathed by politics. As time passed, though, I wondered whether he'd be able to achieve any of his lofty goals, and I became more comfortable with supporting Hillary. Plenty of people find Hillary Clinton and Donald Trump to be equally concerning, but I think many of the concerns about Hillary can be addressed. The most basic, and abstract, is that she can't be trusted; she's crooked. I, too, shared some of this concern heading into the campaign season. However, as the election approached, I decided to spend some time actually confirming or refuting these concerns. After some research, I found a surprising background story. As it happens, much of this crooked/congenital liar/impropriety mythology goes all the way back to the 1990s. William Safire penned a later-discredited take-down piece which set the wheels in motion. Likewise, since the 90s, Republican congressmen have propagated conspiracy theories attempting to implicate the Clintons in the deaths of dozens of people. As one article put it, "it's tough to name anyone conservatives have more vigorously derided throughout the years than Hillary Clinton." In my opinion, it would be irresponsible to let this type of conspiracy-mongering dictate how I vote. One of the more recent, more fact-based arguments against Hillary has been the question of her use of a personal email server while she was Secretary of State. This is an area in which I do have some expertise, given my degree in computer science and my career in information technology. The truth is that I do find this email saga troubling. I know that my employer would not be happy were they to find that I had been forwarding company documents to my personal account. However, my concern is somewhat mitigated by the stories of Colin Powell's recommendations to do just what she did. It's also relevant that FBI Director James Comey found no case to bring criminal charges against her. Based on my reading of his statement, he did not find a solid case that she intentionally or grossly negligently mishandled information, and he basically found that her behavior was par for the course for the State Department. It's unfortunate that she was careless with such important information, but I don't think that this necessarily makes her a terrible person or disqualifies her presidential candidacy. So, in summary, I don't think she's a saint, but I don't think she's the villain she's often thought to be. On a side note, I've also seen some Facebook friends who feel that their Christian values don't allow them to vote for a Democrat; in this case, Hillary Clinton. I don't have as much to personally say about that, but I have read two really good articles by Christian authors on the topic. See the links below. But what good has Hillary Clinton done? Last year, Carly Fiorina quipped, "If you want to stump a Democrat, ask them to name an accomplishment of Hillary Clinton." It's easy to miss her accomplishments, given the popular focus on all her negatives. If you look, though, her accomplishments are not hard to find. As a senator, she helped investigate health issues of 9/11 first responders, among many other things, and as Secretary of State, she was well-traveled and raised the bar for diplomacy. She led the charge on the Lilly Ledbetter Act, negotiated a cease-fire in Gaza, and helped ramp up sanctions on Iran. Finally, in my opinion, her platform for this election is an appealing one. She's pushing for affordable college, protecting and expanding access to healthcare, and rolling back Citizens United. In my opinion, these are all good things. So yes, I'm planning to vote for Hillary Clinton. I could go on and on about almost any sentence in this post, and I could get really negative about any of these candidates. However, I've done my best here to summarize my thoughts on each of the candidates, and hopefully bring a little bit more thoughtfulness to the social media climate. I hope you'll go vote this November 8, and I hope you'll spend some time to get beyond the snarky headlines and sound bites. "Here’s Donald Trump’s Presidential Announcement Speech," CNN, June 16, 2015. "Trump Trots Out Bogus San Bernardino Myth That Smears Muslim Americans," Talking Points Memo, October 9, 2016. "Donald Trump's horrifying words about Muslims," CNN, November 21, 2015. "Transcript: Donald Trump’s Foreign Policy Speech," New York Times, April 27, 2016. "This latest Trump tweetstorm is far more than petty," The Washington Post, September 30, 2016. "Trump calls NAFTA a 'disaster,'" CBS News, September 25, 2015. "The North American Free Trade Agreement," Congressional Research Service, April 16, 2015. "Paris Hilton Is Better At Business Than Donald Trump Is," The Federalist, December 10, 2015. "Donald Trump would be richer if he'd have invested in index funds," Fortune, August 20, 2015. "Both third-party candidates would be terrible presidents," The Washington Post, September 29, 2016. "Friends Don’t Let Friends Vote for Jill Stein," Tablet, August 10, 2016. "Press, lies and Hillary’s campaign: Years of smears have created a fictional version of Clinton. They’re also a disservice to voters." Salon, September 6, 2016. "Fact Check: Clinton Body Bags," Snopes, July 7, 2016. "If You're Liberal and You Think Hillary Clinton Is Corrupt and Untrustworthy, You're Rewarding 25 Years of GOP Smears," The Daily Banter, January 31, 2016. "Hillary Clinton's emails with Colin Powell released," CNN, September 8, 2016. "Statement by FBI Director James B. Comey on the Investigation of Secretary Hillary Clinton’s Use of a Personal E-Mail System," FBI National Press Office, July 5, 2016. "A Declaration by American Evangelicals Concerning Donald Trump," change.org, October 7, 2016. "So you’re thinking of voting for a pro-choice candidate..." Rachel Held Evans, August 2, 2016. "Hillary Clinton's Accomplishments Speak for Themselves," US News, February 19, 2014. "What Is Hillary’s Greatest Accomplishment?" Politico, September 17, 2015. "Hillary Clinton's top 10 campaign promises," PolitiFact, July 22, 2016. These stories are entries from my journal of my trip to Europe from June 8-24, 2013. Wow. I kind of took a break there. Here comes the last one! After a crazy night like I had on Sunday, there were bound to be consequences. And there were. I woke up in my hostel bed and realized it was 8:30, just two hours before my flight. I had planned to get up at 6:45 and leave by 7:30, but that was out the window. I scrambled to put some clothes on and finish my packing (luckily, I had pre-packed most of my stuff to avoid waking roommates in the morning). One crucial item was missing: the key to my locker. My suitcase was in there, along with my passport, among other things. I hurried down to the desk and picked up a backup key, and I was able to get my things. The lack of locker key meant I wouldn't get my 10-euro deposit back, though, and my current balance of zero euros meant I needed to stop at an ATM. While withdrawing money (at about 8:50am), I realized I really didn't have time for my original plan of taking the train to the airport. Luckily, there were two cabs on the street in front of me. The first said he wouldn't accept credit cards (I realized I needed a taxi only after completing my 20-euro withdrawal), but the second guy said he would. I was on my way, and I actually made it to the airport with time to spare. I had some fruit and an orange juice for breakfast at the airport [and I spent the entire Barcelona-to-Frankfurt flight trying (successfully) not to puke]. I mostly slept on the way to Frankfurt. In Frankfurt, I had a Frankfurter and a pretzel for lunch, and then spent pretty much the entire remainder of my two-and-a-half-hour layover waiting in lines and walking. I had to check in with Lufthansa, go through immigration, and go through security again, and immigration was about the most pain-free of the three. I'll probably try to avoid Frankfurt in the future. My flight back to Seattle was pretty average: 767, fat German guy in the seat next to me, and I watched The Life of Pi. It was 10.5 hours, but the movie and two meals helped break it up. Back in Seattle, I caught the light rail and then a bus to get home. Then I went to Tacos Chukis for my traditional post-Europe Mexican food. It was good to be back. New year, new travels. These stories are entries from my journal of my trip to Europe from June 8-24, 2013. Sunday, the 23rd, was my last full day in Europe, so I made it count with a good combination of sightseeing, celebration, and fun times. First on the agenda was a visit to the Sagrada Familia Basilica. 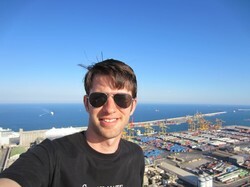 It's another one of my favorite Barcelona sights, and I hadn't seen it since my first trip to Barcelona in 2007. There was a really good special on the construction on 60 Minutes recently, and my desire to see the church again was a big part of my decision to include Barcelona in this trip. The return trip was definitely worthwhile. It was hard to believe how much progress has been made in the last six years. When I first visited, the sanctuary was full of scaffolding, and I think some of the main walls weren't even there yet. You kind of had to use your imagination to picture how it would be used as a church. Now, though, the interior of the sanctuary feels almost complete. In fact, they hold mass there a couple times each month. So much modern architecture is just about building big, practical office buildings, and it's amazing to see a contemporary project that's so artistic and intricate, and at the same time dedicated to God. Needless to say, it's beautiful. After that visit to a church that will be completed in the future (and a break at a park), I took the subway over to a church that was built way in the past: the cathedral. It was built between the 13th and 15th centuries. I wasn't there for tourism, though; I attended mass. I made sure to pick a mass in Castellano ("regular" Spanish) and not Catalan, and I understood it pretty well. As it is in many cathedrals, the mass was pretty traditional and solemn. Kind of weird to have tourists taking video of you as you leave, though. My plan was to go to Barcelona's famous market, the Boqueria, next, but after some wandering (and a quick stop for churros), I discovered it was closed. Should've known. But the day was about to take a turn for the better. Nearby, I ran into my roommate Spencer, who was with his cousin Trevor and some others from the hostel. Apparently they all had the same idea to see the Boqueria. 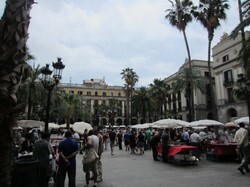 Instaed, we went over to Plaça Reial for a sangria break. The sangria group included me, Spencer, Trevor, two girls named Tara and Gabrielle, from near Brisbane, Australia, and a guy named Michael, from America, who went to Texas Tech. We chatted about football, travel, and Barcelona while we went through a few pitchers of sangria. They were all planning to go on a sailboat cruise that evening, so when we finished, we walked down to the water and bought a ticket for me. On the way back to the hostel, we stopped at a couple convenience stores and loaded up on some cheap sangria and rum for our later drinking needs. After that, we took a break back at the hostel, and I played Uno with some Australian guys. Can't remember their names or which city they were from, but it was fun. We shared some travel stories. Eventually, the others came down from their siestas, and we headed back toward the water. In addition to the others from the midday sangria group, there was a Canadian girl whose name I can't remember. 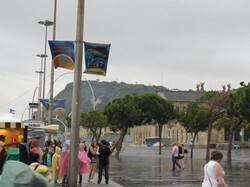 As we walked, it was raining and cloudy, and we had our fingers crossed that the boat trip would still happen. We waited around a bit, though, and it became clear that it wouldn't. The boat company gave us refunds, and we decided to use the money to have a fun night in spite of the weather. 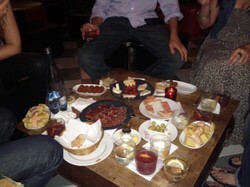 We wandered back up into the Gothic Quarter and found a bar/restaurant to get some food and, of course, more sangria. The food was excellent—all the classic Spanish foods: paella (even though we weren't in Valencia, it was amazing), jamon serrano, some cheeses, some potatoes, and olives. It really hit the spot. As a side bonus, the Spanish national soccer team was playing on TV and doing well. After that, we headed back toward the beach to join in the celebrations. 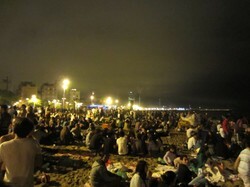 It was the feast of St. Joan (Catalan spelling for John), and it's always a crazy night of fireworks and partying. The festival is also tightly associated with the summer solstice, so there's a lot of beachgoing, partying outside, and firecrackers. Maybe kind of like our Independence Day, but with much more drinking openly. Once we got to the beach (it was a long hike), we stood around for a bit before our attention was captured by a pedal pub: one of those things where you sit around a bar and pedal, like on a bike, and drink, and the thing takes you...somewhere. For us, it was just a trip to the other end of the beach and back, but it was a fun time. It was a good way to see all the partiers and the fireworks on the beach. We stood around for a bit afterward before deciding to get some cabs back to the hostel. We split up, and I went with the Canadian girl, who graciously paid my half of the fare, since I had zero euros left. The celebration didn't end with our trip back to the hostel, though. Several people were hanging out in the lobby, so we kind of just brought the party back with us. The Catalan guy was working the desk again, and he was attempting to show some girls how to play a Johnny Cash song on the guitar, so I joined him. Eventually, the others came back, and the party grew. The guitar was passed around, and we sang along to songs by Weezer, Dave Matthews Band, and the Beatles. Hooray for St. Joan! Saturday was my second-to-last full day in Europe. Time for a train ride to my last stop: Barcelona. 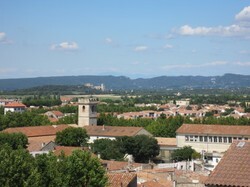 I hopped on an early-morning train from Arles to Nîmes. 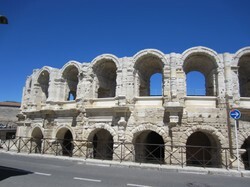 Nîmes seems like an interesting town, but, as in Antibes, I had my suitcase but no place to store it. I hung around the train station and had some orange juice and a croissant for breakfast. 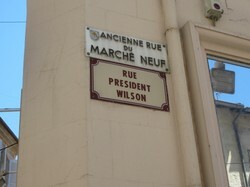 It was my last stop in France, after all. Then it was on to Spain. My train from Nîmes to Figueres, Spain was a TGV, though not as fast as the one I rode from Luxembourg to Paris. 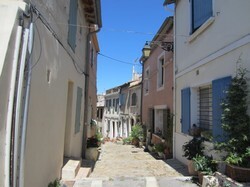 I arrived in Figueres at around noon. The TGV arrives there at sort of a "provisional" station, which is unfortunately way out on the edge of town. I tried to store my suitcase there with no luck. Maybe that's just a Germany thing. My Spanish skills came back to me as I purchased a ticket to Barcelona for later that afternoon. 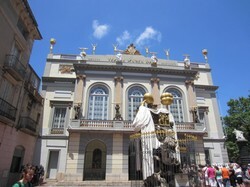 I gave myself a couple hours to go into town and hopefully see its famous Dalí museum. After dragging my suitcase about a mile, I realized my couple hours wasn't enough. I arrived at the museum with about 90 minutes to go and about a 20-minute walk back to the station. Plus, there was a line out the door. I called an audible. 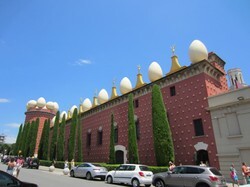 I walked around the outside of the museum and took some photos of its Dalí-fitting eccentricity. It really surprised me how centrally-located the building is, considering how weird it is. I had lunch at a sandwich place next to the museum and sat outside, as was becoming the custom for the trip. 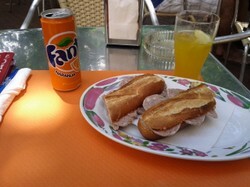 I was excited: I had a bocadillo and a Fanta naranja—my go-to Spanish meal. I think the bocadillo (a sandwich on a lightly-toasted baguette) was made with some Catalan sausage or pork loin. After that, it was time to drag my big rolling suitcase back to the train station. Traveling on Spain's rail system, Renfe, felt the most like flying, in terms of security and check-in process. They didn't open the platform until 20 minutes before the train left, bags had to go through an X-ray machine, and the seats were assigned. At least the coaches were nice. 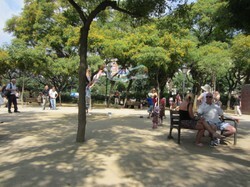 I arrived in Barcelona about an hour later, in the middle of the afternoon. I had a room reserved at the Mambo Tango, a hostel where I stayed in 2009 and enjoyed my time. It seems like they might've expanded, but the place was familiar: a pretty laid-back attitude and a medium size that I liked. Other than the desk guy, the first person I met was one of my roommates: a Canadian guy named Spencer. He was from Calgary (I think) and had been in town a few days already. When his cousin Trevor returned, the three of us went out for some afternoon beers and a snack. I think they were doing sort of an after-college trip. I was excited to share some of my Spain wisdom. After we went back to the hostel, Spencer and Trevor took off, and I went for a hike. 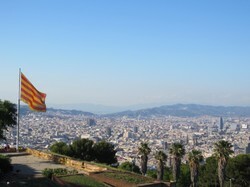 There's a big hill called Montjuïc near the hostel, and I heard good things. It was about a 30-minute hike to the top (I skipped the gondola and opted to exercise). I worked up a bit of a sweat, but the reward was worth it. At the top was a castle and some great views of the city. The weather and my timing were pretty great, too—probably about an hour before sunset. 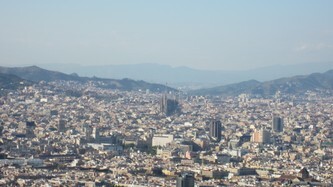 I could see the Sagrada Familia, the coast, the port, and that one building shaped like...an egg. 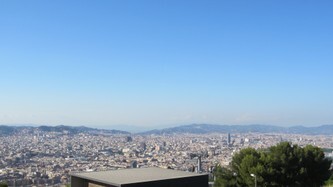 I started to remember why Barcelona's one of my favorite cities in the world. 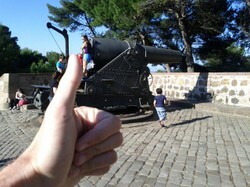 There were some pretty sweet cannons, too. I made the long walk back down and stopped for my second bocadillo of the day. This one was a "tortilla" bocadillo—sort of a potato omelette sandwich. Then back to the hostel, where I ran into another roommate named Jordan. She was a teacher from Tacoma, a city near Seattle. She was excited to get to use her summer break to make a 7-week trip around Europe. Must be nice. 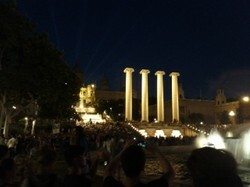 Later, I met up with a group downstairs for a walk to Barcelona's "Magic Fountains." 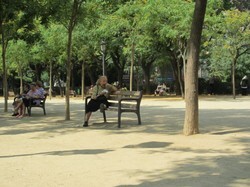 They're one of my favorite things in Barcelona. 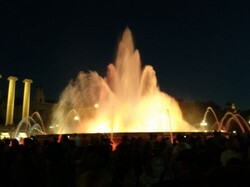 Huge fountains with lights that rotate and dance around to music. Kind of like the Bellagio, but maybe bigger. This was the third time I had seen the show, but it was cool to be there with some folks who hadn't seen it. And it's a show worth seeing more than once anyway. Our "tour guide" was an Australian named Remy, who had only been in town three weeks and actually hadn't seen the fountain before. 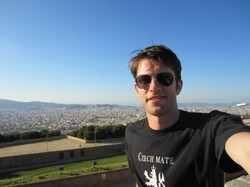 He was spending the summer in Barcelona with a job running pub crawls. After the show, we stopped back at the hostel for a few minutes and then headed out on a pub crawl. 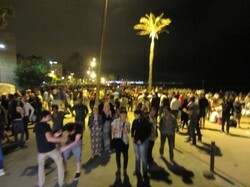 We were going to meet up with people from a few other hostels and then go out. Several dozen obnoxious tourists—what could go wrong? I met a guy named Ricky who was serving in the US Air Force at Rammstein Air Base in Germany. He thought he knew where we were going, but we ended up getting off the subway at the wrong stop and separated from the group. After about 30 minutes wandering around, we called off the search and caught the Metro back to the hostel. The night ended well, though, thanks to the night desk guy. He saw I was kind of annoyed and poured me a couple beers. He was originally from Catalunya (the region where Barcelona is located), which is sort of known for its spirit of independence and desire to secede. He told me how the younger Spanish folks are getting annoyed with the EU—it seems like the rich countries (mostly Germany) get richer while the poor countries (e.g. Spain) get poorer. He said the under-30 population in Spain now has a 50% unemployment rate, and Catalunya really just want to control their own destiny and make their own decisions. Friday was my only full day in Arles, and I made it count, learning about the town's history, seeing its sights, and meeting its people. I took a little longer than usual getting ready, taking advantage of the comfortable bed, privacy, and reliable WiFi—luxuries I hadn't had (all at once) in nearly a week. You don't take a trip to Europe for its comfortable beds and WiFi, though. I started the day with sort of an administrative task: walking to the train station and buying a ticket to Figueres, Spain, for the next day. Alas, another short stay, but I had a hostel reservation in Barcelona for Saturday and Sunday nights that I intended to redeem. After the bookkeeping, I kicked off a self-guided Van Gogh tour, created and narrated by (you guessed it) Rick Steves. 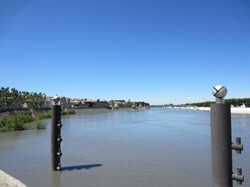 I started at the Rhone, where he painted a "Starry Night" (not the "Starry Night"). Then back to the café from the previous night (not as cool during the day). 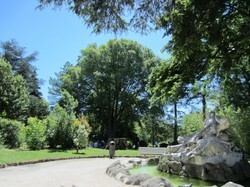 Next was a park where he often painted, the Jardin d'Été (garden of summer). I took some extra time there and enjoyed the flowers, statues, and birds. It's easy to imagine Van Gogh finding inspiration there. 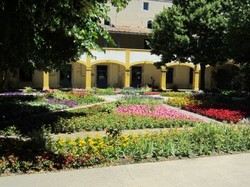 Finally, I stopped at an old former hospital where he stayed and famously painted the courtyard. It was a really neat way to look at the city; kind of makes me wish I could paint. 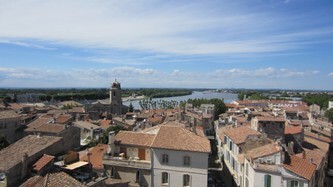 After a lunch (outside, of course) of a panini (and probably a Fanta), I began the next tour: sort of a historical tour of Arles. It began at the Ancient History Museum. 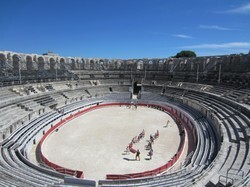 Set on the site of a Roman circus (chariot racecourse—you can still see some of the remains), the museum has lots of background info on the Roman history of Arles. It set me up well for visits to some of the sights later in the day. There were several school groups. On the way back into the town, I stopped for coffee at a small café, which allowed me to sit outside, people-watch, and feel very "European." The cute girl working at the counter was a nice touch, too. 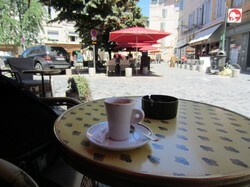 Then it was on to Place du Forum, home of the Van Gogh café that you keep hearing me mention. There's also a statue of a famous author and lots of other cafés and restaurants. 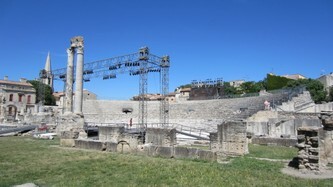 As the name implies, it was the site of a Roman forum back in the old days. Nowadays, it's kind of the center of town. Next was the Place de la Republique, with its obelisk and city hall, and over to the adjacent St. Trophime church. It was built starting in the 12th century. Its outside was cool, but the inside was closed. I got to walk through the cloisters, though, and, well, it's definitely old. Not the most massive church, but it's full of detailed stone work. Apparently they used a lot of stone from the nearby Roman theater. Speaking of the theater, it was my next stop. It was pretty impressive in size and stature, and they had some pretty good representations of how it used to look. It wasn't terribly intact, though, thanks to those church builders, probably. 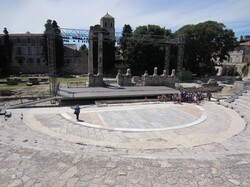 The last stop on the Roman tour was the arena, or amphitheatre, as they call it there. 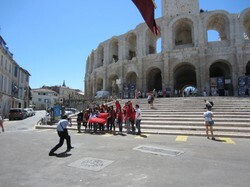 It was probably the most impressive structure in Arles. 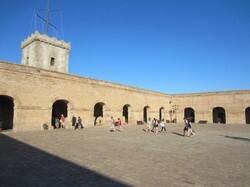 It's relatively more intact than the Colosseum in Rome, and they still have events there (bullfight-type stuff). After Roman times, it actually became a fortified town of its own, with houses, churches, and a town square. 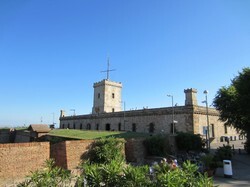 There are a few watchtowers and walls remaining from those days. The arena was the end of the tour, so I went back to the house and did some laundry. No expensive Luxembourgish laundromats this time. My clothes safely in the dryer, I went with Damien, my host, to meet some of his friends for drinks. 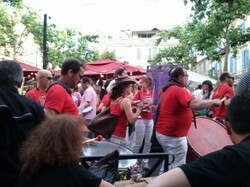 There was a festival of music in town, anchored to the solstice weekend. 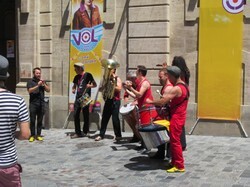 Lots of bands (brass and other kinds) were wandering around town, striking up impromptu performances. I had a pastis—a typical anise-flavored drink of the area—perfect for the beginning of summer. 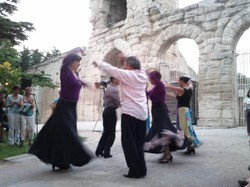 After a while, I went with Damien back to the Jardin d'Été to see his wife, Chloé, perform with a flamenco class. She was on percussion, but there were also guitarists, singers, and dancers. I also got to meet Damien's mom, who was super-friendly and shared her (very positive) thoughts about living in France after growing up in New Zealand. 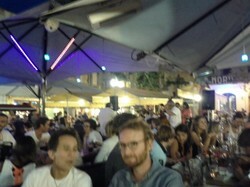 Then Damien and I went back to the Place du Forum to meet more friends for dinner. It was a super-festive atmosphere in the square, and his friends were very friendly, especially considering my novice French skills (they knew English pretty well). I ended up semi-blindly ordering the Plat du Jour (I knew it was something with salmon) and getting a salmon tartare. I enjoy sushi, so no big deal, right? It was actually really good, with some lemony sauce and herbs. And there were au gratin potatoes, and, of course, more rosé. 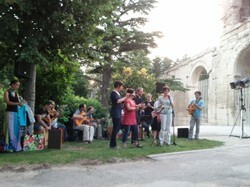 Delicious dinner on a warm French evening, surrounded by French people and music: hard to beat that. 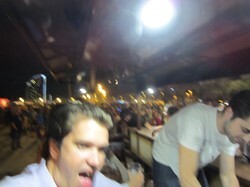 I capped off my last night in France with a few more drinks with Damien's friends. 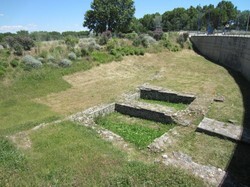 site of "Starry Night Over the Rhone"